As a Games Workshop Manager, people think I have the easiest and cushiest job in the world. After all, I sit and paint models, or play games all day, right? Don't get me wrong, I truly and deeply love my job - I can't imagine doing anything else, and there has never been a single day I've woken up, sighed and said to myself "Damn, I've got work today..." in anything other than a truly joyous "DAYUM! I got work today! YEEEEEEAAAAAAAHHH!!!" manner. Think about it. Thinking that I paint and play all day is the same as thinking that Pet Shop staff get to cuddle the rabbits all day and play with puppies. Trust me, been there, could not be further from the truth - again, not in a bad way. So what actually is my job about? Games Workshop: Epsom, my Hobby Centre (for it is a Hobby Centre, not a shop! More later...), is what Games Workshop refers to as a "One Man Store", or OMS. As with every OMS Manager, the Hobby Centre is closed Mondays and Tuesdays. These are my days off. Wednesday through Sunday, however, it's just me in the shop. I open up and close the Hobby Centre. I serve all the customers who come into the Hobby Centre. I hoover, dust and clean the Hobby Centre. 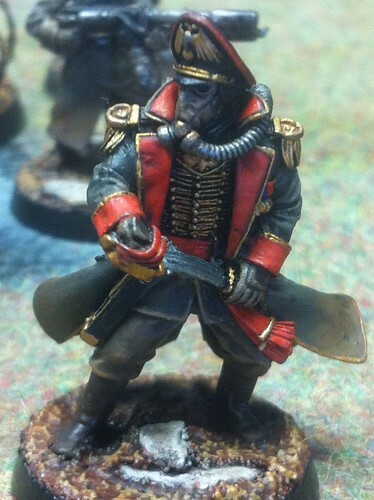 I run exciting activities, like Modelling/Painting Workshops, or Gaming Beginners Academies. I create these events, plan them, promote them, sign people up for them, run them (teaching people how to build, paint and play), review them and then decide if I will repeat them. I do all the paper-work from Health & Safety, Fire & Security, Cash Management, and sorting out cover for my holidays or incidental days I need off. I show people what an awesome hobby this is, and tell them how they can get started. That, in a nut-shell, is my job. Games Workshop doesn't advertise on TV - it'd be a waste of time. We're a niche business and we don't appeal to everyone, nor do we want to. We don't tell you "YOU MUST DO THIS HOBBY! YOUR LIFE WILL NEVER BE COMPLETE WITHOUT IT!" "Most people look at a Citadel Miniature and say 'Oh, that's quite nice', the people we're looking for are the ones with that crazy hobby gene that makes them start frothing at the mouth and rubbing their knees in glee at the sight of a new model." Anyways, I appear to have diverged somewhat from the purpose of this blog post. Back on track, if you please! The biggest part of my job is to find the people with that Hobby Gene, and to show them what our hobby is about, and how they can get started in it. I help them take their first steps, and watch their apotheosis into a fully fledged hobbyist with the teary eyed pride of a new father... From ice cream tubs to figure cases. Now, whilst my job is one of the prides of my life, there are days it can really be hard work. Teaching the kids how to play our games may sound like fun (and it really, truly is) but it can be a lot of hard work trying to keep the focus and attention of six to eight excited ten to fourteen year-olds, help two other guys paint their models, and serve three or four other customers, having good conversations with them all at once. But hey, where's fun without challenge?! Today was one of those days. I should have known it would be one of those days. How come? Well, for the first two hours of being open, it was quiet. Too quiet. The calm before the storm. Sure enough, at 13:00, all hell broke loose and the Hobby Centre changed from a quiet haven for me to paint an entire regiment of Catachan Jungle Fighters To being a buzzing hive of hobby activity. But you know what? That's all part of my job and I love it utterly. This job gives me a deep feeling of satisfaction that very little in life else ever has managed to. I think the only comparable feelings are spending time with a woman you love, a long and hot bath after an epic day at work, or finally finishing an army you've spent months building and painting. Look how damn happy they are!